Kool & The Gang had been present for every single crucial development in funk music-right along with James Brown. . That being the case,the quality of their output during the funk era was very high in relation to their commercial success. By the time the 70’s entered it’s second half, the music was changing. Kool & The Gang for their part responded very well with their previous release Open Sesame‘. And also added more female singers as well and slicker arrangements. By the time they put out this follow up that hadn’t changed for them. Except their commercial fortunes. “A Place In Space”, “Slick Superchick”, “Just Be True” and the title song represent what amounts to five in your face K&TG style funk numbers very much in their early/mid 70’s style period-very high on that quotient on their classic funk sound . On songs like “Mighty Mighty High” and “Oasis”, there’s something of a new element beginning to take root in their sound that can also be heard on “Life’s A Song”. The collective style funk vocals are still a huge part of their sound. They have come to better refine the mellower, melodically crafted elements into their hard funk sound. And why not anyway? K&TG came from a jazz back round and more than knew their way around a wonderful melody. That shows up pretty much on Khalis Bayyan’s flowering solo on the closer “Free”. This album made it clear they’d more than be able to function outside just cranking out popular funk jams. That there was possibilities for something mildly more popularly engaging. The best part of The Force is the message in their music is not only intact, but grown in strength and conviction through the musical changes they were beginning to go through. Still as with the album to come, this would be considered something of a load barring album for the band. An album that was part of a two prong connective thread that served as transitional music between two very different periods of their musical output. Kool & The Gang’s period of being produced by Brazilian jazz funk Eumir Deodato represented the third stage of their musical evolution. The Jersey band started out with their heavy jazz funk style of such albums as Wild & Peaceful and Spirit Of The Boogie. Than they made a series of albums that reflected a growing disco funk vibe from Open Sesame on through their first Deodato production in 1979’s Ladies Night. After that, the band embraced a more post disco/boogie funk oriented sound with radio friendly pop elements. By the mid 80’s, the band were basically radio friendly dance pop. Dealing with K&TG as album artists in the early 80’s was a daunting task for me,having long accepted them as a singles act during that era. One day while looking through the cutout CD bins at a record store called Strawberries in the mid 90’s, I came across a K&TG album from 1982 entitled As One. I recognized the song “Big Fun” on it. And was happy to be able to hear it on the car CD player on the way home. The very first song that played upon popping it in helped me to really understand K&TG’s 80’s funk variant very well. And the name of this particular song was “Street Kids”. George Brown’s drum kickoff begins the song before he puts himself into an in the pocket dance friendly beat for the remainder of the song. Deodato’s bubbling synth bass then proceeds to play call and respond to a two note synth-likely an OBX played by Ronald Bell. On the chorus, JT Taylor’s falsetto vocals play to the tune of Charles Smith’s liquid rhythm guitar-along with the bands powerful and melodic horn charts. There’s a B section with a sustained orchestral synth plays in the back round. This repeats somewhat later in the song as an extension of the chorus,which fades the song out in the end. “Street Kids” is, to me, a superb example of Kool & The Gang adapting their sound for the post disco/boogie era. The horns,guitars and drums are still all the way live. But orchestral and bass elements are now electronic. The lyrics about street kids who “like to play Captain Video” and “doing the motor roller” go right with it. And the groove itself is squarely in the classic funk framework-right in the pocket and right on the one. JT Taylor has a tremendous vocal showcase here. You get his usual smooth tenor, his breathier falsetto and even his rapping. Part of a strong post disco reboot for this iconic funk band. Kool & The Gang are one of a handful of bands whose music shaped the way I perceive music. They first did so with their early 80’s hits,which were newer in the years I growing up. Their 70’s era music had a similar effect when I was in my mid teens. During the 70’s,the were a jazzy funk band heavy on instrumentals. And with a trade off based collective vocal approach. In the 80’s,they’d turned into a hook filled post disco/funk pop band with lead singer J.T. Taylor. And they returned sporadically with other approaches after that. Each era was its own thing musically. But they were always Kool & The Gang. With that being my own view on it,it really took me by surprise when reading Rickey Vincent’s book Funk! in the late 90’s that Kool & The Gang were seen by some as a band who’d gone “far beyond devoid of funk”. Opinions are opinions of course. But ever since that time,especially after going online,its a topic that I’ve wanted to explore with different people. And it would seem Vincent’s viewpoint is shared by many people who admire Kool & The Gang. Even apparently among some members. Today,I’m not writing to counter anyone’s opinion. Simply seeking to pull the whole situation together. The band came together in 1964 when a group of high school friends,among them Robert and Ronald Bell,formed an instrumental group called the Jazziacs. Changing their names to Kool & The Flames,the replaced that word with “gang” to avoid confusion with James Brown’s backup vocal group. Signing with Dee Lite records in 1969,the band actually began to record a series of albums that showcases a percussive,horn based jazz/funk sound that had JB himself referring to the band as “the second baddest out there”,next to him of course. Songs such as “Hollywood Swinging”,”Jungle Boogie” and “Funky Stuff” even crossed over onto the pop charts. 1974’s “Summer Madness” impressed Sylvester Stallone enough that it was used in the first Rocky movie. The bands 1976 hit “Open Sesame”,an middle Eastern influenced disco/funk groove,actually became part of the blockbuster Saturday Night Fever soundtrack. Kool & The Gang’s place in the pantheon of funk and now the disco scene was officially established. One thing that Kool & The Gang still lacked by the end of the 70’s though was a lead singer fronting them. The same year as Saturday Night Fever, the band released a new album entitled The Force. By this time,the female vocal quartet of Beverley Owens, Cynthia Huggins, Joan Motley and Renee Connell were essentially acting as the bands lead voices. And the male group members,who once shared the leads,often did more backup vocals. 1978’s Everybody’s Dancing,as with its predecessor,was not a commercial success. But it did find the band creating a more pop oriented atmosphere with a sound that didn’t deviate much from their “Open Sesame” era sound. Kool & The Gang’s 1977-78 albums were two of the most important albums in their musical evolution. Though not everyone realized that because they had no major single to anchor them in the public eye. By the end of the 70’s,Kool & The Gang actually had a commercially and creatively workable sound to deal with. But they needed a hit. And to do that,they’d need a lead singer. Enter North Carolina native James “JT” Taylor. He joined the band right around the time they began working with Brazilian jazz/funk producer Eumir Deodato to complete the alteration of their sound. Deodato was deep in his disco period by 1979. Especially in his love of instrumental filters and singable melodies. The result of this new configuration for Kool & The Gang resulted in “Ladies Night”,their first R&B/crossover hit in several years. It had a strong funky strut to the groove. And also had a very melodic,singable chorus. The song was a smash,they had a follow up in the slower jam “Too Hot”,JT Taylor was a major success as a lead singer. And next up was their best known pop hit,1980’s “Celebration”. Recently I learned the band didn’t particularly like that song. With one or two people I’ve talked to citing it as having more of a country pop influence than anything. On Kool & The Gang’s four albums produced by Deodato,hits such as “Get Down On It” and “Big Fun” were catchy,horn heavy pop funk pieces. Album tracks such as “Stand Up And Sing” and “Street Kids” (one of my personal favorites) dealt with lean,mean boogie funk with deep and dirty bass/guitar/keyboard riffing. After 1982,Deodato moved on. And so did Kool & The Gang. The bands 1983 album In The Heart and its 1984 follow up Emergency showcased Kool & The Gang as mainly doing pop crossover material. Some with a pronounced new wave influence-even to the point of adding rock guitar solos. Still both of these albums contained funk oriented tunes such as “Rollin'”,”You Can Do It”,”Surrender” and even the hit “Fresh”. On their 1986 album Forever,some of the music leaned more towards danceable freestyle funk. But they were now using synthesized horns. And after this,their sound really wasn’t as strongly rooted anymore. Especially in terms of funk. Many of the strongest and historic bands and soloists in black American music (Miles Davis for example) have a number of distinct creative periods. Some are motivated by desire to grow musically. Others are motivated by desire for commercial success. in Kool & The Gang’s case,it would seem both factors were in play. Their musical sound only ran out of steam when they’d been recording and touring non stop for over 20 years. And that’s perfectly understandable. Now personally,do I feel with all this being said that JT Taylor era Kool & The Gang was lacking in funk? Absolutely not. To be frank,a degree of the criticism against 80’s Kool & The Gang has some of the ingredients that go into the making of jazz snobbery. The band brought a lot of collective improvisation into their sound. And along with it came a strong spiritual identity and a sexually implicit sense of humor. Often times when any group celebrated for their musically improvisational ability begin offering straighter melodies,such a group can find themselves looked down upon as no longer being artists. Of making music only for the purpose of financial gain. In short,becoming sellouts. Because of their successful jazzy funk of the early/mid 70’s,Kool & The Gang have indeed seem to have met with a similar fate to other jazz improvisers,such as the aforementioned Miles Davis, who tweaked their sounds to get more people into their music. Kool & The Gang’s music was always about reaching people from the get go. But as it is in life,people’s musical tastes and interests changed. And so did the band. I applaud Kool & The Gang for so successfully reinventing their funk. Perhaps it will be the passage of time that will show more love for the reinvention of the original scientists of sound. It would take a very long time to even begin to explain why I’ve neglected purchasing this album for such a long time. It would also take a long time to explain my viewpoints on funk music at this point. All I can say is this. A friend of mine once described funk as the “punk music of the black community”,mainly in the sense it was the hardest edge (and by and large most sociopolitical) of the soul music genre. Difference was funk required a very high level of musicianship,usually in a band context to bring out the best in it. 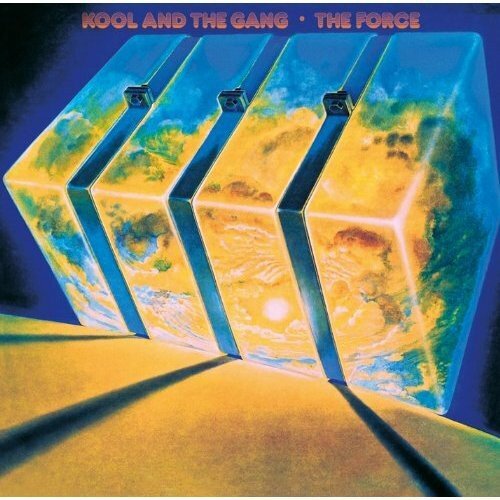 When this album came out Kool & The Gang had been a musically successful recording and performing band for almost half a decade. And had released loads of excellent music,both in the studio and live. But something clicked with this release. It was the “united funk” era. And the music in every sense was in it’s peak period. And this is one of a slew of albums that represents that. 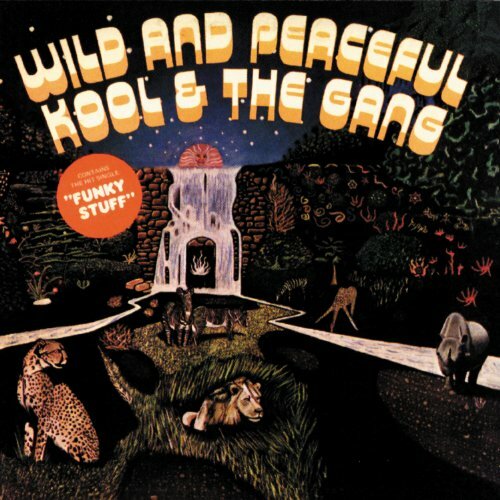 This album got three big pop chart hits for Kool & The Gang,their first if I recall with “Funky Stuff”,”Jungle Boogie” and “Hollywood Swinging”. These songs are 100% first period era K&TG: with the heavy horns,dynamic rhythms and these looseness of playing that defined the bands sound. Aside from that this albums goes deep into another important factor of the funk. Though almost a breezy ballad the conversational “Heaven At Once” finds an adult and teenage man engaged in a dialog over what they should expect of themselves in society. “This Is You,This Is Me” offers a really charged up rhythmic section,with a churning bass/guitar and the message of “in the ghetto I’ve never seen a tree/this is you/this is me” indicating funks central message of the celebration of difference rather than us all being alike. On “Life Is What You Make It”,it’s a very upbeat and empowering groove. The album ends on the 9+ minute title song,a soothing jazz oriented instrumental number giving members Spike and Dee Tee,on trumpet and flute respectively more chances to solo. In a way this album links one era of Kool & The Gang to the next. Earlier on in their career,before this album they’d been a band that emphasized instrumentation more than vocals. Their vocal set up was even looser than their sound was. Even when the harmonies were looking to be close. They seemed to be a band more about music than getting pop hits. Somewhere along the line with this album,pop hits found them. Although in two cases on songs that had a very implicit sexual impulse and one that celebrated their success. At least I’d like to hop it attracted people to the album because the non hit material is often what has the most musical and lyrical value. The message of this album is one that the band would continue on with over the next several albums: a strong awareness of Afrocentric spirituality and a call for unity among all those deemed as unique. This was the conclusion of one era for the band but the beginning of another. But that’s another story. With the beginning of the third official year of Andresmusictalk? 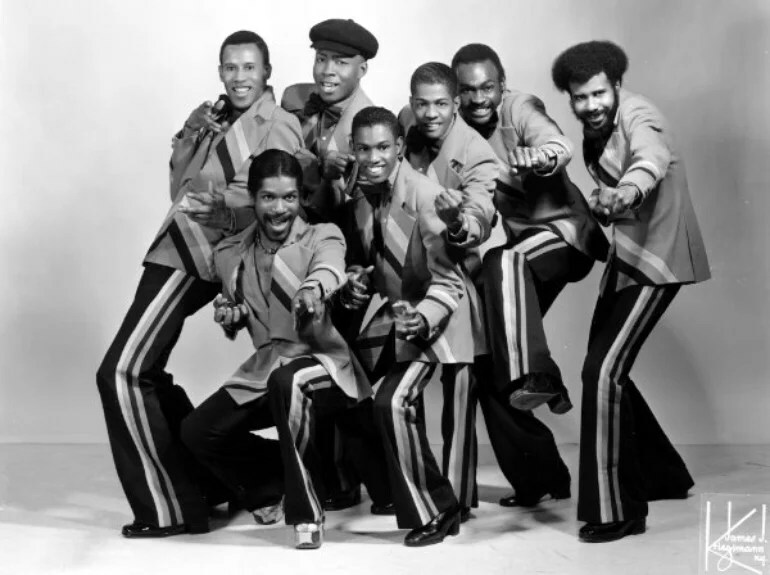 It’s hard to realize that Kool & The Gang have never been officially covered in the Anatomy of THE Groove segment. James Brown himself referred to them as “the second baddest out there” during his prime funk period. And at least somewhere in their now 46 year strong career? The band have continued to find some way to give up the funk,and grow with it’s changes to meet great success. Still,it was the early to mid 1970’s that really showed just what Kool & The Gang were musically capable of. Starting off primarily as an instrumental group with occasional unison vocals? The mid 70’s bought more concise and pop hook driven numbers that focused on individual vocal trade off’s. This resulted in their first massive crossover hits such as “Jungle Boogie”, “Funky Stuff” and “Hollywood Swinging”. In 1975 the band released their sixth studio album entitled Spirit Of The Boogie. It helped define them,and the Bell brothers burgeoning Muslim spirituality,through a stronger Afrocentrity. The song that pulls that all together for me is “Ancestral Ceremony”. The chant”yeah yeah YEAH!” from the bands female backup singers Something Sweet begin it all with the accompaniment of Kalimba and nothing more. Shortly thereafter,drummer George Brown’s phased hi hat roll rings in the percussion,than the steadier main rhythm. A phat and thumping symphony of synthesized and electric bass sets the stage for the bands trademark horns to join into the musical festival. The entire group along with the backup singers join back into the opening chant with Khalis Bayyan’s jazzy tenor sax solo to close out the groove. While just about any funk from Kool & The Gang in this time period is cream of the crop of it’s genre? Something about the instrumental,vocal and thematic attitude of this song sums up the “united funk” era in just over three minutes. 1974-1976 found them at the height of their artistic and commercial pinnacle. And it was good for them personally because the lyrics to this song found them with the understanding of being “scientists of sound,rhythmatically puttin’ it down” while “making merry music” all the way. So this is some of the very finest funk ever recorded!